This article is about the US Open lawn tennis grand slam tournament that takes place in New York USA every year during August-September and is one of the 5 grand slams taking place every year. This article summarieses the US Open lawn tennis grand slam rules, stadiums, prize money awards and a breif history. The US lawn tennis tournament started in 1881, which was limited to men only and which took place in the Newport Casino, Rhode Island. The participation was also limited to the members of the club members of the United States National Lawn Tennis Association. The rules also used to be different as the defending champion directly qualified for the next year's final. The tennis tournament moved about to various cities like in the years to come and many other categories were introduced, including Women's singles and Mixed Doubles apart from the existing Men's singles and Men's doubles category. In 1968, the tennis tournaments from all over the country merged into a single tournament which later came to be known as another Grand Slam and the same year, it was also made Open to the professionals for the first time. This tournament came to be called as the US Open Grand Slam and took place in the West Side Tennis Club in Forest Hills, New York. With 96 men and 68 women participating from all over the world the prize money for the first US Open Grand Slam tennis tournament totaled to be 100.000 USD whose current valuation stands at over 600,000 USD. The US Open lawn tennis Grand Slam rules follows the standard four point winning system and in case of the the ball falling on the line for point, decision of the referee was taken as final. This system was replaced by a review system in 2006, a computer based 3D simulation which provided better accuracy, and a player was entitled to challenge the referee's decision. In the first years, this system was only available to the center courts and since 2009, the system became available to all the courts. Since 2006, many of the decisions has been overturned and the system is well accepted among the players, the spectators and the officials. Since 2007, the review system is being known as the Chase Review in US Open tennis Tournament after J P Morgan Chase who changed the sponsorship of the tournament. All the courts in US Open lawn tennis Grand Slam Tournament has the Deco Turf surface which has the characteristic of having less friction and which produces a little bounce as compared to other hard courts such as Australian Open Tennis Tournament courts which uses a Rebound Ace surface. The US Open lawn tennis Courts have been found to be a favorite for the "serve-and-volley" players taking part in the tournament. The center court of the US Open lawn tennis tournament was named Arthur Ashe Stadium after the 1968 US Open tennis champion. The court was inaugurated in 1997 and contains 22,547 seats. 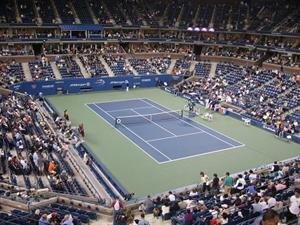 The adjacent court is the second largest court and is named the Louis Armstrong stadium containing 10, 200 seats and which served as the court for the major matches from 1978 to 1996 till the inauguration of the Arthur Ashe stadium in 1997. The third largest stadium is called the Grandstand Stadium and has a capacity of 6000, attached to the Louis Armstrong stadium. The remaining courts serve as the venue for the preliminary rounds and have a capacity of 1000 each. All the courts of the US Open lawn tennis tournament are made blue in color for clear view of the ball. The stadiums are well lighted and prepared extensively for quality telecast all over the world, the primary telecast rights being possessed by USA Network, ESPN2 and CBS. US Open grand slam lawn tennis prize money, awards and ranking points. 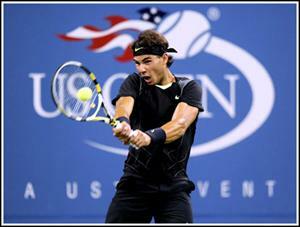 As of 2010, the total prize money for US Open grand slam lawn tennis tournament sums up to about 21 million USD. The prize money is divided into the following divisions. The prize money for the US Open tennis men's singles and women's singles titles are as follows, The winners in men's singles and women's singles category are awarded 1,650,000 USD each. Each of the champions also collects 2000 rankings points in ATP as well as WTA systems. The runners-up in each category, men's singles and women's single are awarded 800,000 USD each along with 1200 ATP ranking points and 1400 WTA ranking points. The semi-finalists in each are awarded 400,000 USD each in either categories along with 720 ATP points and 900 WTA points. The quarter-finalists are awarded 175,000 USD each in either categories along with 360 ATP points and 500 WTA ranking points. The prize money for US Open tennis men's and women's doubles tournament category are as follows, the winners are awarded 420,000 USD combined, the runners-up are awarded 210,000 USD, the semi-finalists are awarded 105,000 USD each team and the quarter-finalists are awarded 50,000 USD each team. The ranking points collected by each team however follow the same pattern as the men's and women's singles title. The prize money for US Open lawn tennis mixed doubles tournament category, the Champions are awarded 180,000 USD, the runners-ups are awarded 90,000 USD, the semi finalist teams are each awarded 30,000 USD each while the quarter-finalist teams are awarded 15,000 USD each along with the same pattern of ranking points each by ATP and WTA as the men's and women's singles. The prize money is accompanied by the honour of the US Open tennis grand slam trophy for the winners and the runners-ups and the names of the champions are engraved on the trophies every year on cumulative basis.